The Scottish GENES blog has now ceased publication - for continuing Scottish news please refer to its sister blog, British GENES, at http://britishgenes.blogspot.com. The Scottish GENES posts will remain online as an archive of Scottish genealogical news from 2007-2011. Alba - agus Scottish GENES - gu bràth! Every year around 300,000 people die without leaving a will. If no-one is found to inherit their money it goes to Her Majesty's Treasury – and that's where the heir-hunting companies step in. It's a competitive world for the heir-hunter organisations as they race against each other to find any long-lost relatives who might be entitled to inherit. A new series of Heir Hunters will follow investigators from a number of different heir-hunting companies as they travel the country tracking down the unsuspecting beneficiaries of estates worth thousands of pounds. This third series of the BBC One show will also tell the stories of some extraordinary cases of the last few years. Controller of BBC Daytime, Liam Keelan, says: "Heir Hunters lifts the lid on this rarely seen world and follows the stories of the unsuspecting heirs, and has proved to be a subject that has struck a chord with viewers." 20 x 45 minutes have been ordered from Flame TV. Series Editor for Flame is Matthew Gordon and the Executive Producer is Roger Bolton. Executive Producer for the BBC is Jacqueline Hewer. The series is due for transmission in summer 2009. Follow the tension, tears and triumphs in the world of this unique band of investigators in the third series of this observational documentary. Companies wishing to take part in the series should email heirhunters@flametv.co.uk. The next series of Who Do You Think You Are has now been officially confirmed by the BBC Press Office as transmitting on Wednesday 13th August 2008. In a break from previous years, the first episode featuring Patsy Kensit will be shown at 8.00pm to 9.00pm on BBC1, though it is unclear as yet whether this is down to the coverage of the Olympics, or whether this will be a regular timeslot. For more information, visit http://www.bbc.co.uk/pressoffice/proginfo/tv/wk33/wed.shtml. The recent announcements of joint census projects with FamilySearch and affiliate companies, such as findmypast.org and Ancestry.com, have caused some confusion. FamilySearch patrons and indexing volunteers are wondering if the indexes created from their efforts will continue to be free to the public. The answer is a resounding YES! All data indexed by FamilySearch volunteers will continue to be made available for free to the public through FamilySearch.org—now and in the future. Access to related digital images may not always be free to everyone. Working jointly with other organizations ensures wider availability to improved indexes and provides a tremendous benefit to millions of people around the world who are seeking to connect with their ancestors. FamilySearch is committed to working with records custodians around the world to provide faster access to more records for more people. The general public will have several options to access any fee-based images offered under FamilySearch affiliate agreements. 1) Home access will be free for FamilySearch members; 2) access is free through a local Family History Center or the Family History Library; 3) access is often free through the record custodian or archive reading room; or 4) for a nominal fee, the public can access the images on specified record custodian or commercial Web sites. As a result of a recent partnership with British Origins, abstracts of the 1890 British and Irish passenger lists are now online at WorldVitalRecords.com. .“We are very optimistic about our relationship with FamilyLink.com. Since we started our company we have wanted to get our name and products over to the North American market,” said Ian Galbraith, CEO, British Origins. “It was a no-brainer to partner with a U.S. firm and Paul Allen was a guy we wanted to do business with." “British Origin’s partnership with FamilyLink.com brings much needed records to a U.S., as well as a worldwide audience,” said Yvette Arts, Director, Content Partnerships, FamilyLink.com, Inc. “British Origins has been great to work with. We look forward to posting more of their records, such as the York Medieval Probate Index and the York Peculiars Probate Index in the next few months. "These passenger lists contain nearly 200,000 passenger names of people that left British and Irish ports with U.S. and Canadian destinations, as well as one voyage that continued to the West Indies. These records have added value because, in many instances, multiple individuals from the same family were included on these lists. Each record contains the name of the passenger, nationality, occupation, age, and marital status, as well as the name of the ship, the departure port, and the destination port. The nationalities of the passengers included in these records are, approximately, 57,000 from Ireland, 100,000 from England, 14,000 from Scotland, and 24,000 from other locations. Between 1890 and 1920 a large number of ships left from British and Irish ports with North America as the destination. Many of the passengers aboard these ships were emigrants from Great Britain and Ireland. However, many emigrants from other European countries traveled through the UK because the cost to sail from a UK port was cheaper than sailing from a continental port. Since the shipping companies required at least six weeks British residency, many individuals changed their names to avoid detection, rather than waiting for their residency to become valid. The Passenger Lists were compiled by Peter Coldham, directly from the original lists located at The National Archives, London, and augmented by Canadian and U.S. data. I just want to give a plug for a great website entitled Anthony Maxwell's Scots Heraldry (click to view). It is a blog designed to keep the reader appraised of all items of interest on the heraldry front, not just in Scotland but in other countries where heraldry is still a concern. Beautifully designed and very informative, it is well worth dropping in to have a rummage around! Short and sweet this month, as everybody is away on holiday! The 21st Blackhouse will be on show in the AHS marquee; if you can spare an hour during the day to help on the stand, please let the Chairman know. Publications will be on sale. Western Australia Genealogical Society Inc.
Sun 17th Aug 2008, 2.00pm, at Unit 4, 48 May Street, Bayswater. Incidentally, as a part of this event I will be giving a one hour demonstration on how to use the Ancestry.co.uk website at the A. K. Bell Library from 10.00am - 11.00am. If you are a reader of this blog, do say hi! Mon 25th August 2008 - partial opening. Free search sessions from 10.00am - 12.00pm and 2.00pm - 4.00pm followed by a short tour and talk on the centre and its records. Sessions must be booked. Further information will appear at www.scotlandspeoplehub.gov.uk in the near future. An exhibition blog at http://www.nls.uk/blogs/500years/ gives a week by week programme of events that tie in with this exhibition. An index to soldiers commemorated on the war memorial in Keith has just been made available by the Moray Burial Ground Research Group on their website at www.mbgrg.org . This is on top of their recent addition of buried stones from Birnie Churchyard, as described in The Forgotten Tombstones of Moray Vol 6, which have also been added to the on-line index. "Once we go back beyond the period of civil registration, census returns and uniform parish registers, it becomes more difficult to trace a family tree. This talk will look at early parish registers, wills, apprenticeship records, hearth tax returns and other records to see how progress might be made when the going becomes difficult." To hear the lecture, visit http://www.nationalarchives.gov.uk/podcast/17century-ancestors.mp3?pod=rss . The 1891 Census for Canada has been launched on Ancestry. The 1891 census includes seven provinces - British Columbia, Manitoba, New Brunswick, Nova Scotia, Ontario, Prince Edward Island, and Quebec – and the Northwest Territories, which at the time was comprised of the districts of Alberta, Assiniboia East, Assiniboia West, Saskatchewan, and Mackenzie River. Other unorganized territories are also included. According to the editor of the BBC Who Do You Think You Are magazine (on the magazine's forum earlier today) the first episode of the new series is due to be broadcast on BBC1 on Wednesday 13th August at 9pm. The first celebrity to be featured will be Patsy Kensit, and after each programme has been transmitted there will be information about each episode, including lists of locations and unseen footage, available on the magazine's website at www.bbcwhodoyouthinkyouare.com. There has been no official confirmation from the BBC itself, but a press release from April about the new series can be read at http://www.bbc.co.uk/pressoffice/pressreleases/stories/2008/04_april/03/think.shtml. Museums Galleries Scotland has announced details of Big Lottery Funding of £590,000 for the continuation of a museums-led initiative that will see young people working with older generations in communities across Scotland. Their Past Your Future Scotland Phase 1 commemorated the 60th anniversary of World War II through a touring exhibition and a series of community events including local exhibitions, entertainment, and events specifically created to generate intergenerational learning opportunities. One of the biggest outcomes was the gathering of invaluable first hand accounts, experiences and veterans stories that otherwise would never be known. The majority of these were extracted through interaction with schoolchildren or groups of young people. Such is the success that Their Past Your Future Scotland Phase 2 will bring together young people and older generations in communities across Scotland capturing oral histories focussing on World War II and subsequent conflicts. The outputs from these oral history projects will be a series of some 300 online mini-exhibitions or 'vignettes' - oral histories and illustrative or contextual items from local and national collections. These may include diary extracts, newspaper articles, old photographs, archival film, documents, paintings, and photographed objects. Together, they will create a vivid story of a person, event or location. The projects will cover a multitude of themes including Women in the Shipyards; Letters from Home; The Sea, Wrecks and Beachcombing; and The Clydebank Blitz. One project will see the Argyll and Sutherland Highlanders recall and discuss their experiences and memories of conflict with young Duke of Edinburgh's Award participants and members of the Tullochan Trust, an organisation providing diversionary activities for disadvantaged young people in the west central belt of Scotland. The Argyll and Sutherland Highlanders have been involved in virtually every post-war conflict, including Korea, Malaya, Aden, Northern Ireland through to Iraq and Afghanistan, reflecting Scotland's involvement in conflict, peace-keeping roles and army life from World War II to the present day. The first 10 museums and gallery projects of a possible 15 were also announced at an event at the Gordon Highlanders Museum, Aberdeen. Culture Minister Linda Fabiani said: “I’d like to congratulate Museums Galleries Scotland on the continuation of this wonderful and significant project. Phase 2 of Their Past Your Future will again see young people and older folk working together in communities across Scotland to deliver a body of work which will be thought provoking as well as entertaining. “Scotland’s older people have a mine of information, stories and experience to impart and it’s therefore heartening to know that some of it is being captured through projects such as this for the benefit and education of younger citizens and the wider community. Their Past Your Future Scotland will culminate with the launch of a website in 2010. The vignettes and other outputs generated will available as a classroom teaching aid via Learning and Teaching Scotland’s new Scottish schools’ intranet, Glow. This ensures these projects become a rich educational resource for teachers and a global legacy for young people and the wider community involved. Gordon Highlanders Museum, Aberdeen, "Post-War Conflicts and Peace-Keeping Missions"
In February of this year, a New Zealand judge made a nine year old girl a ward of court during a custody hearing, so that she could change her name from Talula Does The Hula From Hawaii. New Zealand does not allow names that would cause offence or that are longer than 100 characters, and in this case, the name was seen as potentially embarrassing and likely to cause a social disability. OK, it's not quite Sunday, but it's never too early to bring you the Good News...! The launch of the http://www.codexsinaiticus.org/website is the landmark first phase of an extensive online initiative to reunite the different parts of the Codex Sinaiticus, the world's oldest Bible and the most important Biblical manuscript, now held in four separate institutions. Written in Greek by hand in the mid-fourth century around the time of Constantine the Great, it originally contained the whole of the Old and New Testaments and the Apocrypha, though half of the Old Testament has since been lost. It contains the oldest known version in the world of the New Testament, and the surviving manuscript concludes with two early Christian texts, an epistle ascribed to the Apostle Barnabas and ‘The Shepherd' by Hermas. In a ground-breaking collaboration between the British Library, the Monastery of St Catherine (Mount Sinai, Egypt), the University Library at Leipzig (Germany) and the National Library of Russia (St Petersburg), the full text of the manuscript will be accessible in one place for everyone to research and enjoy by the end of the project in July 2009. The cutting-edge interactive website, going live on 24 July 2008, aims to make the Bible as accessible as possible to scholars and enthusiasts alike. Users will be able to read and explore a full transcription of the Greek text, including all the corrections added throughout its long history. A translation of selected books and passages will be provided in English and German. Images and transcription are fully cross-referenced; pointing at a word on the transcription, for example, will highlight the equivalent word in the image. Leading genealogy and family networking site Geni.com today announced that it is emerging from beta with a number of new features including video sharing and tree merging. Combined with existing features such as photo sharing, calendar, timelines, and news, the site provides a complete suite of free tools for families to build their family tree, preserve their history, and stay in touch in a private, secure environment. Geni now offers unlimited, free, and private video sharing for families. Users can instantly tag which family members are in their videos and permanently archive their videos by adding them to the family timeline. Geni excels relative to other social networking sites when multiple people in the same family tag their media (photos and videos) with a common event, thereby creating a virtual scrapbook of that event. For example, multiple family members can instantly create a virtual scrapbook of a wedding by tagging all their photo albums and videos with that event. "Despite an abundance of video sharing solutions online, there isn't really a great way to share family videos," said David Sacks, CEO of Geni.com. "Having a six-month-old baby, I speak from experience. YouTube is designed for mass publishing, and my friends on Facebook don't want to see dozens of baby videos. But my family does. Geni provides a convenient way to share and preserve these memories." Geni has also released tree merging, the ability for family members to merge their trees together. This enables users to create a single family tree that is more complete and accurate than their individual trees. Geni's conflict resolution tools help to find and resolve any duplicate nodes on each tree. Geni has released a complete set of tools that enable its users to find and stay in touch with their relatives as they capture and share their family's history. Since launching in January, 2007 as a beta site, Geni has released birthday reminders, photo sharing, calendar, privacy controls, family news, timeline, GEDCOM import, and much more. Geni.com is a free tool for understanding and staying in touch with your family online in a private, secure environment. Geni was a winner of the 2007 Webware 100 Awards, which named it one of the top 100 sites on the internet and one of the top 10 reference sites. It is by far the youngest site to receive this honor. It was nominated again in 2008 in the social (networking) category. In May 2008 Time™ Magazine named Geni.com one of the Top 50 Websites of 2008. As well as this, some additonal features not mentione din the press release include a cause of death field for your online trees, the abil;ity to control how many generations to view at one time on screen, anniversary notices, a 'recently online' feature to tell you who has been popping by, and much more. I first came across this site at Who Do You Think You Are event earlier this year, and have had lots of fun on it since. Definitely worth having a look at www.geni.com . Discounted vouchers for the ScotlandsPeople website are available for sale at the Mitchell Library in Glasgow. Normally the cost for access is £6 for 30 credits, but the Mitchell is selling starter vouchers for £6 with 60 credits, and top up vouchers at a 20% discount, i.e. £4.80 for 30 credits. (With thanks to Talking Scot poster Nelmit). In the last few days, FamilySearch have announced major collaborations with Ancestry and FindmyPast. See FamilySearch teams up with British partners and FamilySearch and Ancestry announce partnership over US census records . A news release today gives more information as to the collaborations. Approximately 46.3 million new records and 1.2 million new images are now available on the Record Search pilot at http://pilot.familysearch.org. This brings the total number of names available on the test site to 467,180,871. Two new Records Access projects (1841 & 1861 England Census collections) were published with links to images on findmypast.com. This is important because it tests the pilot search engine’s capacity to ingest third party indexes and link to images hosted on affiliates’ sites. Such functionality enables FamilySearch to better fulfill its goal to increase access to more genealogical records faster for its users and members. Recent Records Access news announcements can be found at FamilySearch.org. The ScotlandsPeople website is asking customers to participate in a survey, which can be viewed at the following link - ScotlandsPeople Survey. 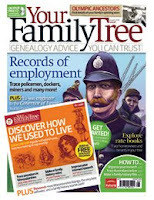 The latest Your Family Tree magazine (issue 67, August 2008) is now on sale, packed with goodies. The lead article looks at how to trace various employment records, with other articles examining subjects as diverse as travelling performers, rate books, newspaper research, how to create a family history film, Australian research, and the Edwardian Olympics. On the Scottish front there is coverage on the test census being carried out next year in Edinburgh, Lewis and Harris, the opening of the new Perth family history centre, and Donald Trump's brief visit to his mum's croft on Lewis, whilst en route to buy the country in her memory (or something like that!). Yours truly also offers an opinion piece on where to go for genealogical entertainment once family history programmes outstay their welcome on television, as they inevitably will one day! The Irish Family History Foundation has just announced the online release of census transcriptions for 1901 and 1911 (partial) for County Mayo. It was only a few days ago that I said to expect these records to start appearing thick and fast! It would seem that the IFHF have been spooked by the imminent arrival of the free to view fully digitised images of both of these censuses from the National Archives of Ireland (see 1901 and 1911 Irish online censuses - major update), and that they are now trying to get what they have online as quick as possible to make a cynical quick buck beforehand. Again,as with the records for Noth Tipperary, it will cost five Euros to see a transcription. I've made the point before, but perhaps it needs to be said again. In my opinion, the IFHF charges too much for what it offers. The fact that it would seem to be making records available for a premium that will soon be available for free anyway, is to my mind indicative that the organisation is more concerned with its own needs than its customers. I believe that if it concentrated on making available what others do not have, the organisation will provide a much more useful service to the genealogical community. And if it lowers its prices, it will gain considerably more respect, and almost certainly more customers. Honestly folks, I would personally recommend that you save your hard-earned money. By this time next year, you will be able to see the original documents for free of charge, courtesy of Ireland's National Archives. If, however, you do need to see these transcriptions urgently, they can be viewed at http://mayo.brsgenealogy.com/index.php?&set=yes . My apologies to everyone who has been seeking information about timescales for the further releases of the 1911 and 1901 census records online. Thank you for your patience, and your messages of encouragement regarding the Dublin 1911 material. Our Canadian partners have been engaged in an extensive procurement and recruitment process to hire contractors who will finish the project. That process has now been completed, and I’m pleased to be able to tell you that the records for Kerry, Antrim and Down will be going online in October of this year. The rest of 1911 will follow quickly thereafter in batches of counties, in the order listed at http://www.census.nationalarchives.ie/about/futureplans.html. I expect to have more precise timescales for the other counties as soon as the contractors start work, which will be in early August, but it is intended that all of 1911 and 1901 will be online by mid-2009, as originally scheduled. The timescales will be posted at http://www.census.nationalarchives.ie/about/futureplans.html. Again, my apologies for your having to wait to get this information, and my thanks for your patience. I hope that the website’s continuing augmentation will fulfil your expectations and provide a fruitful free resource for family and local history. This is brilliant news for those with Irish ancestry. It should be noted that the Irish Family History Foundation only a few days ago launched its 1901 census transcription service, commencing with North Tipperary (see IFHF commences release of 1901 Irish census indexes), through which they intend to sell these records at 5 Euros a household. In light of Catriona's announcement, you may wish to keep your purse or wallet closed for a few months - the National Archives project is completely free to view, and will have the digitised remains of the original household schedules, not transcriptions. I've said it before, but I will say it again - the National Archives of Ireland are a big bunch of luvs...!!! SALT LAKE CITY—Ancestry.com and FamilySearch, the two largest online family history resources, announced today they will exchange records and resources to make more historical records available online. The first project is a joint initiative to significantly enhance the online U.S. Federal Census Collection (1790 to 1930). The original census records are among the holdings of the National Archives and Records Administration (NARA). FamilySearch is digitally converting master microfilm copies of the original U.S. Federal Censuses from 1790 through 1930 and, under this agreement, will give these improved images to Ancestry.com. All census images and indexes will be available on Ancestry.com for subscribers. As projects are completed, images will be available for free in NARA reading rooms and FamilySearch’s 4,500 Family History Centers. Ancestry.com, which currently offers indexes and images to the entire publicly available U.S. Federal Census Collection, will give FamilySearch copies of its existing census indexes. Through its online indexing system and community of volunteer indexers, FamilySearch is already indexing select censuses. FamilySearch will merge the Ancestry.com indexes with the new FamilySearch indexes to create enhanced census indexes, which will be added to both sites. Indexes to the enhanced censuses will be free on Ancestry.com for a limited time as they are completed. Indexes will also be available for free on FamilySearch.org. The first census exchanged is the 1900 U.S. Census. FamilySearch completed a 1900 index in addition to Ancestry.com’s original. In the new index, FamilySearch added several new fields of searchable data, such as birth month and birth year, so individuals can search for ancestors more easily. The two indexes will be merged into an enhanced index, available on both sites. The new 1900 census images are now available on Ancestry.com. The enhanced 1900 index will be available for free for a limited time at Ancestry.com and ongoing at FamilySearch.org. Ancestry.com will also provide FamilySearch its original 1920 U.S. Census index. Using the Ancestry.com index as a first transcription, FamilySearch will create a new second index with added fields and arbitrate any discrepancies between the two indexes. The 1920 project is currently in progress. Individuals interested in helping create the improved index can volunteer at FamilySearch.org. Once completed, the enhanced 1920 index will be available on both sites and will link back to images on Ancestry.com. The 1850 through 1870 (partial) and 1880 and 1900 U.S. Censuses can be searched currently at FamilySearch.org; all publicly available U.S. Censuses are already available on Ancestry.com. “The U.S. Censuses are arguably the most important collection of U.S. genealogical records. FamilySearch is excited to see the complete, improved indexes of these collections freely available online over the next two years. And we look forward to working with Ancestry.com to enhance access to additional, significant collections in the future,” said Jay Verkler, Managing Director for FamilySearch. SALT LAKE CITY—FamilySearch announced today that it is joining forces with findmypast.com, The Origins Network, and Intelligent Image Management—companies that specialize in providing online access to British family history resources—to make significant British historical record collections more broadly available online. The first joint initiative seeks to publish online indexes to censuses for England and Wales from 1841 to 1901. The 1841 and 1861 Census indexes are the first targeted under the agreement and are accessible now at FamilySearch.org and findmypast.com. In the agreement, FamilySearch, in conjunction with The Origins Network, will provide digital images for the 1851, 1871, and 1881 Censuses. It will also extend the 1871 Census index. Findmypast.com will provide FamilySearch copies of its English and Welsh Census indexes from 1841 to 1901. The Federation of Family History Societies will help complete the index for the 1851 Census. Initially, users of FamilySearch.org will be able to do a free search by record type, given name, surname, age, gender, place of birth, and relationship to head of household (relationship was not recorded in the 1841 Census). The free search capability at FamilySearch.org will include additional fields of data in the future. Users will be able to search the full indexes and view original images for free at FamilySearch’s 4,500 Family History Centers or for a nominal fee at findmypast.com. The addition of findmypast.com’s English and Welsh Census Collections to FamilySearch’s online databases will increase the use of the valuable record sets and increase traffic to findmypast.com. FamilySearch will utilize its impressive online community of volunteer indexers to add more fields of data to select censuses. When finished, the improved census indexes will be available on FamilySearch.org, findmypast.com, and Originsnetwork.com. Individuals interested in volunteering as online indexers for British historical projects can do so at FamilySearch.org. Ian Galbraith, CEO of The Origins Network and Upal Rahman, President of Intelligent Image Management (IIM) Inc. said, "The FamilySearch England and Wales Census project is clearly a milestone initiative in the history of genealogical research. It heralds a new era of easier accessibility to a mountain (literally!) of genealogical material available hitherto only to the privileged few, if at all. We are delighted to be working with FamilySearch and proud that they have chosen for the FamilySearch Website the 1841 and 1871 UK censuses—the most accurate available—which The Origins Network and IIM jointly developed." This month's Family History Monthly (issue 160, September 2008) has articles looking at the Tay Valley Family History Society, pre-1841 censuses, how to trace your Norman blood, the pawnbroker industry, the sinking of the Lancastria, County Fermanagh ancestry, land tax records and much more. Yours truly has also contributed an article on family history courses and how to become a professional genealogist. All for the recession busting price of £3.75, available now at any newsagent's worth its salt...! There's an interesting article at the BBC website today regarding the Kirk's records about the ancient Highland practice of using charms for good and for ill, and the ancient fears about witchcraft. The ScotlandsPeople Centre website has just been updated to show not only an impressive range of photos from the Queen's recent visit on July 4th, but also, more importantly, a visual presentation of the new centre, room by room. The new centre opens to the public on August 25th with a series of free two hour research sessions. For more information, visit http://www.scotlandspeoplehub.gov.uk/Building.htm. The latest podcast from The National Archives at Kew is from William Spencer, who examines the key records for tracing World War One ancestors, including records of women who were nurses or in the Women's Army Auxiliary Corps. DNA profiling would appear to have finally solved a mystery surrounding the deaths of the Russian royal family, the Romanovs. Research by Dr. Peter Gill of the University of Strathclyde's Centre for Forensic Science, in conjunction with colleagues in the Armed Forces DNA Identification Laboratory and the Institute of Legal Medicine in Innsbruck, Austria, has shown that the remains found in a second grave at Ekaterinburg, Siberia, are of the same DNA profile as those found in an adjacent grave previously found in 1993 and 1994, which were proved to be related to Tsarina Alexandra. It is believed that the new remains are those of a fourth princess and the heir apparent to Tsar Nicholas II, Alexei. Tickets are now on sale for the Angus and Dundee Roots Festival, which will take place from September 6th - 13th 2008. There will be a Gala Dinner at Guthrie Castle on Saturday 6th with Nick Barratt as the guest speaker, priced £50 per person. A barbecue on Sunday 7th will cost £12 for adults, £10 for children at cafe Byzantium, Minikie Country Park, and on Friday 12th there will be a ceilidh on board HM Frigate Unicorn, priced £20. Tickets for all three events are available from Arbroath's Webster Theatre (Tel. 01241 435800) and from Dundee City Box Office (Tel. 01382 434940). The 16th century Old Town Cemetery of Stirling, situated by the town's castle, is to be restored. The £1.7m project by Stirling Council is expected to be completed by July next year. BBC Scotland's Radio 4 genealogy series Tracing Your Roots have produced a couple of CDs featuring 3 pogrammes of the first series on each CD. The postage will be paid by the BBC. The Irish Family History Foundation has just announced that IFHF member centres which have completed indexes of Irish census returns will shortly begin to make this data available online. To start the ball rolling, the 1901 Census of Ireland records for Tipperary North are now available at http://tipperarynorth.brsgenealogy.com/. These records are transcribed copies of the original household returns, and not digitised images. There are 67,213 records as a part of this collection and the cost to view is €5.00 each. Each record lists first name, surname, occupation, age, relationship, religious denomination and origin. It should be noted that the 1901 Census is due to be digitised by the National Archives of Ireland, with their Canadian partners, as soon as the 1911 Census has been fully digitised and made available. Unlike the IFHF site, these will be the original records and will be free to access. Dublin 1911 is currently available for free at http://www.census.nationalarchives.ie/search/. As such, you can expect the IFHF sites to release what they have in the very near future! The University of Strathclyde's Postgraduate Certificate in Genealogical Studies course is seeking applicants for the next run which begins in January 2009. Teaching will be held at the University's Centre for Lifelong Learning, and will run for 11 Saturdays from early January 2009 until the end of June 2009, from 10.00am to 4.30pm, and at other times, by arrangement (such as evening visits to libraries and archives in Glasgow and Edinburgh). There is also a distance learning option which uses the University's VLE (Virtual Learning Environment) and requires good computer access and IT skills. Online students follow the same course as the Campus-based students, and the same schedule. There is online support from specialised tutors and opportunities for interactivity. For both Campus-based and Online, the submission date is October 13th 2008 at the latest, with offers by the end of October and final sign-up before the end of November. All acceptances, payments, references, etc. must be received before the end of 2008, for a January 2009 start. The price for the course has increased slightly, now standing at £2000 for UK based students and £2800 for overseas. As of next year, the follow on postgraduate diploma will be entirely by distance learning. Entry to this is by successful completion of the PG certificate. For more information on the course (including an online admissions form), visit http://www.cll.strath.ac.uk/cpd/genealogy/ , and for a look at the course timetable, the student handbook can be viewed online at http://www.cll.strath.ac.uk/genealogy/PG_Genealogy_Handbook_2008-9.pdf. On June 23rd, this blog announced a new website that provides access to Griffith's Valuation of Ireland. Please note that the URL for this has now changed to http://griffiths.askaboutireland.ie/gv4/gv_family_search_form.php. It is by far the best site dedicated to these records. So who has the biggest family tree?! Located at the blog of Ancestors magazine's editor Simon Fowler is a story about Ray Blackmore, a 76 family history enthusiast who has traced 10,000 members of his family tree, going back 1500 years. The research has taken him 28 years, and is to be shown in an exhibition at Taunton Library in Paul Street, Taunton. For more on the story, visit How Far Back Can You Go?. Just as remarkable, DNA has taken two German family historians back to the Bronze Age. Little did Manfred Huchthausen and Uwe Lange, of Söse Valley in Lower Saxony, realise that the bones of one their ancestors from 3000 years ago were lying in the caves within which they used to play as children! Your Family Tree magazine has the story on its blog at DNA Reveals Bronze Age Ancestors. Scotland's Greatest Story helps solve lost poet mystery! On Saturday, I posted a link to a BBC story requesting information on a lost poet called George Colburn (see Search for a Lost Poet). On the back of our post and the BBC request, the mystery has been solved! Chris Moorhouse of Scottish International Relief was trying to identify more information about Colburn, the author of a book entitled "Poems on Mankind and Nature", published in 1891, which had come into his possession at the charity's bookshop in Ayr. Many readers, including SGNE blog reader Bonnie Malmat based in Fort Lauderdale, Florida, were able to piece together information on Colburn's early life and family, with Bonnie providing a vital clue regarding his birth, and the change of the name from Cockburn to Colburn. Here at SGS we also chipped in, and were able to find out a considerable amount of information about George himself, from additional sources. By searching the National Library of Scotland catalogue we established that Colburn had two other printed works held within its collection, being the 1883 collection "Poems: historical and descriptive, with introduction by D.H. Edwards" and the 1923 publication "Day in the glen, in reminiscent mood". Adding to the original book review of the "Poems on Mankind and Nature" book that had already been found in the Scotsman, we were also able to find a review from the Herald on October 10th 1891, from the 19th Century British Library Newspaper Collection. Then it gets interesting! From the National Archives of Scotland catalogue we established that George, a fruit merchant based in Glasgow, was sequestrated in November 1905, and by examining the Edinburgh Gazette, we identified four articles detailing the process of his bankruptcy, which was cleared in 1908. Finally, as well as his death certificate, we also investigated his wife, who predeceased him. Whilst the census suggested that she had been born in India, we found the actual record which showed her birth as being in Madras in 1860. Chris Moorhouse has been delighted with the response: "This isn't just a book of poems, it's a book by someone who we now know quite a lot about, who kept it, and wrote in it, for 40 years. Although it's probably quite valuable, I would feel uncomfortable just selling it in the shop. SIR would like to make sure that the book ends up somewhere safe, so we are in discussion with several libraries, including the National Library and Laurencekirk library, about the possibility of passing it on to them." However, the mystery does not end there! Chris would now like to find out more about two poems in the volume which were inspired by real life heroism. The first concerns a foreman platelayer named James Watt who prevented a train accident on November 21st 1910, which would have killed 300 fisher girls if it had happened. The second concerns a person called Sandy M. Adam of Laurencekirk, who died whilst trying to save life at St Cyrus on 26 August 1919. So if you fancy another challenge, do drop Chris a line at chris@sircharity.org (please mention the blog! ), or you can pass your findings to us and we will send the information on. This blog is usually rapier like with the speed in which it reports the genealogy news that matters. Occasionally though, we, err... miss things! The following story announced a few weeks ago completely slipped past our radar, but is of such major significance to those in Scotland with ancestry in Northern Ireland, as indeed to the people in Ulster itself, and beyond, that it is presented here in glorious posterity...! In an online article dated May 21st 2008, the PRONI website announced that the Public Records Office of Northern Ireland is due to move to an all new purpose built facility in the city's Titanic quarter. The new office is to be built in the Titanic Quarter of Central Belfast, where a major redevelopment project comprising commercial, tourism, residential, educational and other uses is already underway. Once complete, it will literally be the case that you can hop onto a ferry at Stranraer and end up at Belfast next door to the PRONI, as opposed to having to travel to the other side of the city, as is currently the case. The alternative route is Troon to Larne, and a train to York Street station, again, next door to the docks. In other words, it will become much more practical to be able to do a day trip from Scotland to Ulster to carry out some research at the centre. Now if they could only restore the Troon to Belfast route...! The Islands Book Trust has announced further details on its emigration conference, to take place in South Harris from Thursday 10th-Saturday 12th September 2009, as part of Scotland's Year of Homecoming. The conference will bring together expert speakers covering the main destination areas of Hebridean emigration overseas (eg Canada, USA, Australia, New Zealand, Patagonia) with local people and those returning to visit the land of their ancestors. Speakers will include Professor Tom Devine, Margaret Bennett, Bill and Chris Lawson, and Greta Mackenzie. A full programme will be announced later this Autumn. Accommodation and meals can be arranged locally for those who require it. A second hand bookshop in Ayr is looking for details about the poet George Colburn, author of "Poems on Mankind and Nature", a book which turned up in its stock recently. To date, the shop's owner Chris Moorhouse has only found a review of the book, which was published in The Scotsman on 7 September 1891. Another clue to the family lies in a note which states that his nephew drowned off the coast of Italy in 1916. For the full story, visit http://news.bbc.co.uk/1/hi/scotland/glasgow_and_west/7500238.stm. As part of the Homecoming Scotland celebrations next year, the ScotlandsPeople Centre will be hosting a series of exhibitions to reveal the Scottish connections and family histories of some currently living famous Scots. Further information about the exhibitions will be made available later in 2008, but enquiries can be sent to the project team at FamousScots@nas.gov.uk. Homecoming Scotland 2009 is a chance for members of the Scottish diaspora to return to Scotland to trace their roots. If you haven't booked your plane ticket yet, then run quickly to your local travel agent and beg him to make room for you on the first plane over in January! The country is waiting to greet you, and at Scotland's Greatest Story, we'll be only too happy to help you trace your ancestral roots! The ScotlandsPeople Centre opening date of August 25th has at long last been confirmed by the project's website at www.scotlandspeoplehub.gov.uk, though there will be a restricted service initially. From the 25th, visitors will be able to use the Adam Dome and the shop only, and will be able to book free two-hour search sessions to gain access to all the centre's records, with the sessions available from 10.00am to 12.00 noon, and 2.00pm to 4.00pm. These sessions will be followed by a talk and a tour around the centre. From the opening day, it appears from the website that the Dundas Room might be temporarily closed, and access to both the Reid and Matheson Rooms will also be deferred. It is unclear when the full service will commence. There are two other search rooms in the GROS building, and from another source I have heard that these may still be running the DIGROS system in the short term (as indeed the Dundas Room may be). The website promises a further update shortly, including details on how to book the free search session and price details for copies of records, so hopefully the situation will be clarified soon! Findmypast.com has today announced the addition of parish records to their site from over 1,000 parishes across England and Wales, offering online access to baptism, marriage and burial records dating as far back as 1538. From today over 15 million parish burial records and memorial inscriptions will be available to view at www.findmypast.com, with a further 7 million baptisms, marriages and probate records to be made available online later this year. The parish records collection brings together in one easy-to-search central place the disparate records from local parishes, which have been collated by local family history societies since 1911, coordinated by the Federation of Family History Societies. The registers are particularly valuable sources of information for research prior to the statutory records down south which began in 1837. Complementing the records from the National Burial Index and the registration of death indexes (1837 - 2006), which are also available to view on the site, the parish burial registers are an extremely valuable resource for family historians, containing information such as key dates, relatives of the deceased and the place of abode. With the website's cross-database search facility, it is also possible to search for an ancestor by surname across all the parish records on the site without needing to know where in the country they came from. For more information, visit the site at www.findmypast.com. If you regularly visit the Scottish Genealogy News and Events blog, you can now subscribe to the service through a site feed website such as Net Vibes, Google, Atom and others. To sign up, please use the links at the top right column of this page. As mentioned on this blog on July 7th 2008, Scotland Online has rebranded itself as brightsolid. The company, which operates both the FindmyPast and ScotlandsPeople websites, and which recently won the tender to digitise the 1911 census of England and Wales, felt that a change was needed to represent its new portfolio. Apparently they have carried out research which concluded that the company was seen to be "bright" in terms of its people and approach, and "solid" in terms of its resilient infrastructure and delivery. Quite possibly, but it does not really say much about what it actually does in the world...! It may also be premature. The contract for ScotlandsPeople is due for renegotiation next year, and in conjunction with the article in last week's Sunday Herald (see GROS to end monopoly on its data? ), which stated that the Scottish Government is considering the sale of additional licenses to its GROS data, one has to wonder whether there isn't more to the name change. The new exec in charge of brightsolid is Chris van der Kuyl, who the Scotsman recalls in 1999 addressed the Labour party conference to say that he would turn his computer firm VIS Entertainment into a £500 million empire in just three years. Five years after the speech, he sold it for £4.5 million. In the same article, he is claimed to have stated that he would see brightsolid grow into a company worth "double figure millions" in the next few years. So will the company have a bright and solid future? DOVE and MAGPIE to fly no more? GROS to end monopoly on its data? Scotland's top genealogical discussion forum - the 'Friendly Forum'! Plus ScotlandsFamilyTree TV Channel - 24 hours a day! There's even more content on Twitter! In February 2010, SGNE was voted one of the five best 'Heritage' blogs for genealogy by readers of American based Family Tree magazine. Many thanks! SGNE was voted one of My Heritage's top 100 blogs in May 2010 - thanks! Scottish GENES: Copyright Chris Paton 2008-2010. Picture Window theme. Powered by Blogger.